There's lots of irony in the fact that Michael Jackson saw fit to scoop up the publishing rights to the music of both the Beatles and Sly and the Family Stone. For MTV's first generation, Jackson represented the king of "crossover," but people with longer memories know that Sly and the Family Stone laid claim to that crown a full decade earlier. In fact, when the Beatles went their separate ways in 1970, lots of discerning music fans looked to Sly and his band mates to fill the void the Fab Four left behind. Note: Russell Hall is a freelance writer whose work has appeared in Goldmine, Request, the Oxford American, and other publications. The group Little Sister was a female trio organized by Sly Stone consisting of Vaetta Stewart (Sly's little sister of course), Mary McCreary and Elva Mouton. The group had two Top Ten R&B singles. "You're the One-Part 1"reached #4 of the R&B charts in the early part of 1970 and "Somebody's Watching You" reached #8 on the R&B charts in late 1970. These singles capture the same spirit as the seminal Sly & The Family Stone album, "There's A Riot Goin' On," which was released at the end of 1971. Little Sister was involved from the first Family Stone album, "A Whole New Thing"and subsequently sang backup vocals on many, if not most of Sly & the Family Stone's records. They are featured heavily on the Sly & the Family Stone album Fresh. The recently released, "The Essential Sly & The Family Stone," showcases the Little Sister contribution as the remastering process has brought their voices to the fore. Many fans speculate that Little Sister released a whole album, when in truth, four singles were released. They were, "You're The One" Pt. I, "You're The One" Pt. II, "Stanga" and "Somebody's Watching You" . The singles were all written, arranged and produced by Sly. The release of "Somebody's Watching You" marks the first time a drum machine then called a "rhythm box" or "funk box" was used in a popular recording, a frequently used item in the studio some 35 years later. The same machine was used again on the #1 single from There's a Riot Goin' On "Family Affair" which propelled the new instrument into the spotlight even further. 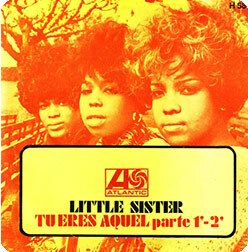 All Little Sister singles were released on Sly's own Stoneflower label through an exclusive agreement with Atlantic Records. Other artists who were released on Stoneflower included Joe Hicks and the group 6ix.